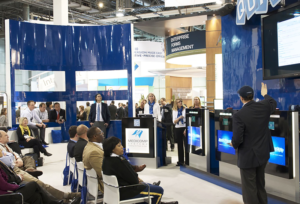 Challenge: Market Medicomp Systems’ new electronic health record (EHR) user interface to system developers. In addition to creating awareness of the new product, awareness of Medicomp was needed as well. Competition for the audience’s attention was also a challenge given the surge of new products into a very competitive marketplace, where there were mixed messages relative to new and emerging government requirements and regulations. While the new product’s usability appealed to the end user or “clinician”, the developers (Medicomp’s customer) were driven by a number of motivators including their company development strategy and the bottom line. Solution: The new product brand was launched in tandem with the company rebrand, enabling both the company and product to benefit from the momentum of a larger campaign strategy. Product name and tagline communicates the product’s most important feature, usability, along with the decision support feature. This is communicated by the name Quippe, derived from the Latin word meaning “to concur”. 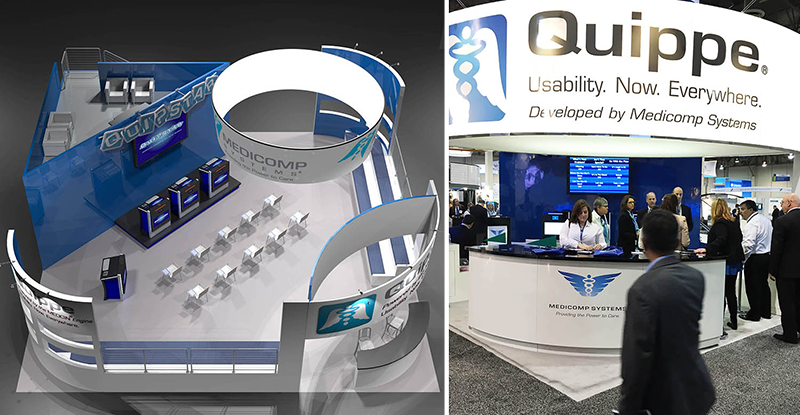 Result: The center of the Quippe product introduction and Medicomp rebrand campaign was the development of a large promotion that premiered at HIMSS, the healthcare IT industries largest and most important conference. 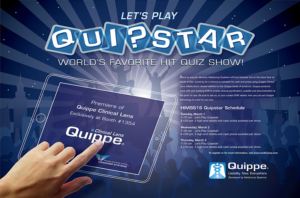 TWP developed a name and brand for a game show type of promotion called Quipstar, World’s Favorite HIT Quiz Show. It was developed as a fun way to get a very targeted audience, most of whom attended the conference, to use Quippe to compete in a game show setting. The brief training and use of the product in the fast paced environment resulted in Medicomp actually “proving that Quippe could be learned and used effectively in 20 minutes or less”. 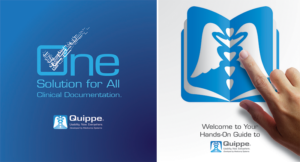 Hundreds were able to experience Quippe in three days. Industry influencers and media were recruited to provide interest and excitement to the show with positive press and contracts resulting from the engagement. Pre, onsite, and post outreach strategy ensured that participants were targeted and engaged. In addition to the promotion, advertising campaigns, print and electronic sales materials, electronic and social media, exhibits, signage, video and a public relations campaign were developed to promote both Quippe and Quipstar.